Xabier Benito Ziluaga is a member of the European Parliament from the GUE/NGL group, Spain-Podemos. After two rounds of talks, the European Parliament and the Council have agreed to strengthen EU investment in African and neighbouring countries as part of the European External Investment Plan (EIP). I have been a strong advocate for increased funds for international development, in line with the EU´s international obligations. Such funds can improve the lives of people in developing countries if put to the service of local priorities, principles of social justice, and equal partnership. However, the proposals presented under the EIP, to support investments by public financial institutions and the private sector, threaten the integrity of the mechanism because of the way they politicise international development assistance. Their stated aim is to address the root causes of migration flows to the EU, an extension of the controversial security deals the EU has signed with countries like Turkey and Libya to prevent the arrival of migrants on Europe´s shores. The latest “Guarantee Funds” agreed by MEPs and EU member states under the EIP aim to gradually shift existing funding from Turkey towards other countries who will then similarly play the role of policing Europe´s borders. Instead of providing migrants and refugees with safe and legal channels into the EU and sharing responsibility for them equitably, the EU has put in place policies to limit arrivals and to outsource responsibility to repressive regimes. This is exemplified by the deals the EU has signed with Turkey and Libya. In the latter case, migrants and refugees have been subject to torture, abuse and sold into slavery. Tens of thousands are being kept in overcrowded detention centres. The EU has not only been aware of the extent of human rights violations in Libya but has worked closely with Libyan authorities to stop sea crossings and keep people in Libya. This makes the EU directly complicit in these abuses. Furthermore, the EU and its member states have struck deals with Libyan local authorities and the leaders of tribes and armed groups as part of its efforts to externalise border controls. The EIP will condition EU cash on these countries´ ability to manage migration flows to Europe. Funding will be used as a bargaining chip for countries to hold refugees hostage, as Libya is doing at the behest of the EU. Investments for socio-economic development are to be used to whitewash the EU´s ugly militarisation of borders and outsourcing of repression. This is a shameless exploitation of economic power to subordinate poor countries, a form of neo-colonialism. Furthermore, the Guarantee Funds will be used to protect private investors from risks of possible losses through the use of public funds at the expense of taxpayers. Contrast all this with EU human rights discourse. Its alleged commitment to international rights instruments, including The 1951 Refugee Convention, and the way it positions itself as a role model when it comes to respecting human rights. In reality, individual member states have rolled back asylum rights at the national level and the Commission´s proposed reform of the common European asylum system is designed to close Europe off rather than affirm human rights principles that had formed the basis of post-World War II order. It is in these subtle and not so subtle ways that we see how right-wing populism has swept into EU policy at the highest levels. While the proposal had some positive elements, such as support for meeting Paris climate agreement targets and the Millennium Development Goals, I could not vote for these EIP instruments in their current form. The EU needs to show genuine solidarity with displaced people and honour its international commitments. It is urgent to have safe and legal channels to prevent the unacceptable deaths in the Mediterranean and the criminal smuggling networks. The EU´s development cooperation policy should be based on equal partnerships, with locally defined priorities to genuinely benefit ordinary people. EU investments should not be used to blackmail or externalise borders. 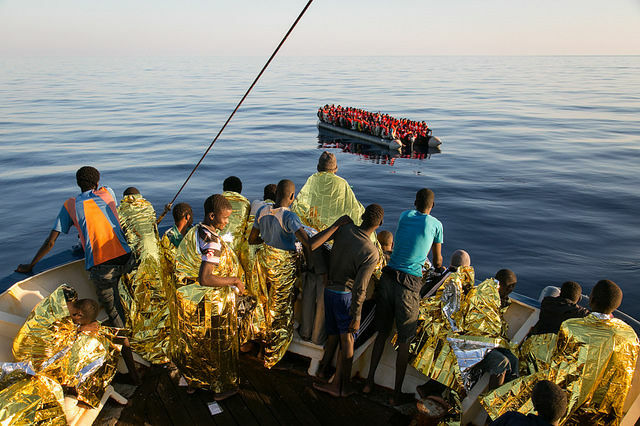 Above all, if the EU really wants to tackle the root causes of forced migration, it must reassess its policy of arming repressive regimes, military interventions and weapons sales. Europe´s support for the true root cause of forced migration makes us all complicit in the kind of abuse and degradation that this continent claims to have confined to its history books. Europe should cut all development aid and build a big wall. We have no obligation at all to these countries. They should solve their own problems.